Product information "Light Weight Cold Plates for Low to Medium Power Densities"
These very cost-effective cold plates are ideal for battery cooling in automotive and traction as well as many other industrial applications. They are made of aluminium sheets and despite their low weight have a uniform temperature distribution, with temperature differences of about 3 K across the surface of the cold plate. 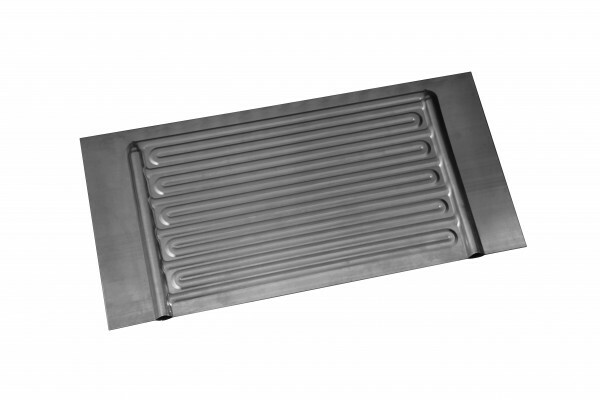 High efficiency, model flexibility and excellent corrosion protection are further advantages of these cold plates that are produced in a special process allowing for particularly low pressure drop values to be achieved. Either a mixture of water and ethylene glycol or industrial refrigerants such as HFC 134a or R600a can be used as coolants. On the manufacturer's special machines, light weight cold plates with a width of up to 550 mm and a maximum length of 2500 mm can be produced as single pieces or in large series quantities. Each model is custom designed to meet the requirements of your project. Our thermal management specialists will be happy to support you with the design and simulation of your custom solution based on our light weight cold plates – contact us today! Related links to "Light Weight Cold Plates for Low to Medium Power Densities"
Customer evaluation for "Light Weight Cold Plates for Low to Medium Power Densities"